Abberley Guest House - Balgowan Accommodation. "A Country Style Guest House"
This is a uniquely furnished room with a comfortable queen sized bed and an en-suite bathroom with a bath and shower overhead. The room includes a full size wardrobe, bureau with vanity mirror and space to work, bedside tables, basic kitchenette and a small dining table. With it’s own small veranda, there is plenty of space to make yourself feel at home. This room has an overhead fan and like all the rooms at Abberley, also has an oil heater and access to WIFI. This is a uniquely furnished room with a comfortable queen sized bed and an en-suite bathroom with a bath and shower overhead. The room includes a full size wardrobe, bureau with vanity mirror and space to work, bedside tables, basic kitchenette and a small dining table. With it’s own small veranda, there is plenty of space to make yourself feel at home. This room has an overhead fan and like all the rooms at Abberley. This is a uniquely furnished room with a comfortable king sized bed and an additional single bed (in the same room). An en-suite bathroom with a toilet, basin, bath and shower. The room includes a full size wardrobe, bureau with vanity mirror and space to work, bedside tables and a basic kitchenette. With it’s own small veranda, there is plenty of space to make yourself feel at home. This room has an overhead fan and like all the rooms at Abberley. This is a uniquely furnished room with a comfortable queen sized bed. The en-suite bathroom has a bath and shower. The room includes a full size wardrobe, bureau with vanity mirror and space to work, bedside tables and a basic kitchenette. With it’s own small veranda, there is plenty of space to make yourself feel at home. This room has an overhead fan and like all the rooms at Abberley, it also has an oil heater. A large, airy and bright room with a comfortable queen sized bed. This private, romantic studio is furnished in a charming countryside theme with an old Victorian bath in the room. This studio also has a kitchen, small lounge and a quaint verandah. This self-catering cottage has two double bedrooms with two bathrooms – one with a shower and bath and the other with a bath. One room has a comfortable queen sized bed and the other a double bed. This unit includes a kitchen with all amenities, a dining area and a lounge. Sit on the large verandah outside and enjoy the view out to our forest. Besides an oil heater, this unit also has a fireplace. This self-catering cottage has two double bedrooms, a separate bathroom with a toilet, shower and bath. This cottage includes a kitchen with all amenities, a dining area and a small lounge. Sit on the verandah and enjoy the view out to our forest. Like all the rooms at Abberley, this room also has an oil heater. What is included in the price per night for the rooms? The price is for the room only. Breakfast is separate. What kind of breakfast is served? Our breakfast is pretty special ;) We serve it down at our quaint little cottage cafe. It's usually a full breakfast starting with muesli, yoghurt and sautéed berries followed by the traditional bacon, sausage, mushroom, eggs and toast. Then finished off with a nice warm cup of whatever caffeine fix you need for the day. Breakfast is served from 08:00 until 10:00am on Saturdays and Sundays. Is Abberley close to any wedding venues? 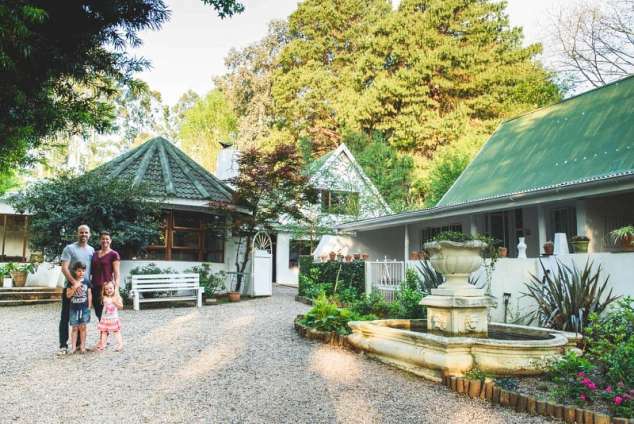 Orchards Wedding Venue, The Glades Farm, Woodridge and Michaelhouse are all in a radius of 5km of Abberley Guest House. Yes, but only in front of the four garden rooms. We are working on improving the reach to all the other rooms soon. The majority of our rooms are semi self-catering with microwaves, fridges and kettles. Our two bedroom cottages "Parsley" and "Sage" and our Garden Deluxe Studio "Sweet Basil" are fully self-catering. Unfortunately not. You'll have to settle for the sweeping forest and valley views instead. In a radius of 10km or less, you can enjoy a meal at a restaurant such as, La Lampara, Caversham Mill, Rawdons or The Bierfassl. Are kids under 12 allowed? Yes, all ages of children are welcome. Is Abberley Guest House wheelchair friendly? Take the N3 west (to Johannesburg). Take exit 107 “Howick North / Tweedie”. At the top of the off ramp, turn left. At the T-junction turn right onto the R103 signposted “Lions River, Balgowan, Nottingham Road”. Travel approximately 18km on the R103. At the Michaelhouse sign, turn right onto the Currys Post Road and travel approximately 5km until you see the Abberley Guest House sign on your right hand side. Take the N3 south (to Durban). Travel through the Mooi River toll. Take the “Nottingham Road / Mount West” exit. Turn right to Nottingham Road. At Nottingham Road take the R103 to Balgowan. Travel approximately 15 km. At the Michaelhouse sign,turn left onto the Currys Post Road and travel approximately 5km until you see the Abberley Guest House sign on your right hand side. 402 page views since 13 Aug, 2018. Last updated on 14 Aug, 2018.